Agreeing on a fair settlement amount with the insurance adjuster for the damage claim on your vehicle is an important first step. When doing so, you will receive a check from the insurance company along with a release that you will have to sign. You will have to sign and return the release before you are able to cash the check, but it is extremely important to read the documents you are signing to make sure they state the check is for the “Property Damage Claim” or for “Property Damage Only” especially if there is a pending injury claim involved with your case as well. Once you sign a release, that forever stops you from claiming any additional damage to your vehicle, even if you find out later there was something you missed. In addition, if you sign a release that does not include any amount of compensation for your physical injuries you will not be able to receive money for that either since a release prevents you from claiming that as well. This is why you must be completely aware of the document you are signing and agree with it in full before filling out the release, another reason to want a knowledgeable attorney. The amount you are allowed to collect as compensation from another party’s insurance company or from your own insurer when the other driver has no insurance may vary depending on the degree that the other driver was at fault for the incident. 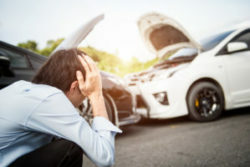 This fact changes though when you make a claim for the damages under your own collision coverage, as the degree of fault is no longer relevant and the claim will be paid no matter who is at fault through your collision coverage. If you have been involved in a car accident you need an experienced lawyer like the ones at the Paris Law Firm. They will guide you through this complicated process and get you the compensation you deserve. Call us today or contact us via our online contact form to schedule an initial case evaluation.